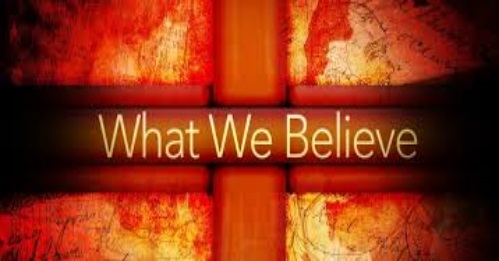 WE BELIEVE, in One God; Creator, Redeemer and Sustainer, who provides order, purpose, meaning and fulfillment to all creation. That in Jesus Christ, who was born of Mary, God became human and is Sovereign Lord of life and history. That in the Holy Spirit, God is present in the world, empowering and guiding believers to understand and live out their faith in Jesus Christ. WE BELIEVE, that persons are created in the image of God and destined to live in community with God, with other persons and with all creation. That, by disobedience, they have become sinful, but, by grace through faith, they are redeemed in Jesus Christ. That being entrusted with God’s creation, they are called to participate in the establishment of a just and compassionate social order. WE BELIEVE, that the Church is the one Body of Christ, the whole community of persons reconciled to God through Jesus Christ and entrusted with God’s ministry. WE BELIEVE, that the Holy Bible is a faithful and inspired witness of God’s self revelation in Jesus Christ and in history to illumine, guide, correct and edify believers in their faith and witness. WE BELIEVE, that God is at work to make each person a new being in Christ, and the whole world, God’s Kingdom – in which love, justice and peace prevail. That the Kingdom of God is present where faith in Jesus Christ is shared, where healing is given to the sick, where food is given to the hungry, where light is given to the blind, and where liberty is given to the captive and oppressed. WE BELIEVE, that the resurrection of Jesus Christ has overcome the power of death and gives assurance of life after death, and we look forward to His coming again in all fullness and glory to make all creation new and to gather all the faithful under God’s Kingdom. The UCCP Statements of Faith.